2. All the friends form teams i.e Jupiter/Mars/Moon & Saturn/Mercury/Venus. The Rahu Ketu axis separates the friends and enemies with Sun, Mars, Jupiter on one side and Mercury, Venus, Saturn on the other. 3. The self (first house) is represented by all the archetypal male energies. These male energies are Sky, Air, Lightning and Sun which are all situated above the feminine Earth. Aquarius the electric air sign rises on the Ascendant. The Ascendant lord Saturn is in a sky/space nakshatra Punarvasu and is conjunct Venus in Ardra, a nakshatra closely associated with lightning. The Sun is placed in Krittika a nakshatra ruled by Sun and is strong in a quadrant house through its association with Ketu (which increases a planets strength fourfold through close conjuction). 4. Mercury is the connecting point of the whole chart and is the atmakaraka (soul significator). Mercury is connected with Venus through an exchange. Saturn and Moon are in Mercury’s signs, Gemini and Virgo respectively. Mercury is conjunct Sun and Ketu. It is related to Rahu by aspect. It is related to Mars by being placed in its nakshatra Mrigashira, and related to Jupiter by Jupiter’s placement in Mercury’s nakshatra Revathi . 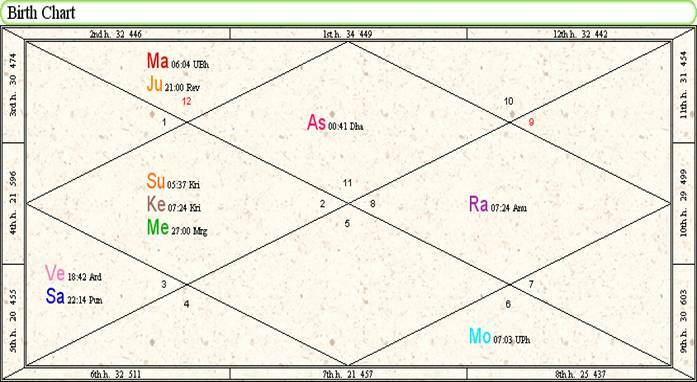 So Mercury the atmakaraka and buddha/vishnu planet is aptly the pivot of the chart. 5. All the four elemental triangle lords are connected. For example the first triangle is comprised of 1st , 5th and 9th lords Saturn, Mercury and Venus who form a team and the second triangle is comprised of 2nd, 6th & 10th lords, Jupiter, Moon and Mars who form another team. 6. Born at midnight (20th changing to 21st) in India, when it was midday (20th) at the temple in ChichenItza. The temple was built to align perfectly for showing Sun's exact conjunction with Pleiades, the central star Alcyone in the era 1970-2012. 7. Mercury and Venus are the Quetzacoatel (coat of many colours) planets in the chart, because they stick with the Rahu Ketu Serpent axis even in the navamsha. Venus in Gemini is the plumed serpent, the archetypal Birdman. The 4th house represents vehicles in the chart, so Venus the 4th and 9th lord can be seen as acting like the vehicle for Saturn, the Self significator. Venus is thus playing a Garuda role. It is placed in the shastiamsha Amrita, symbolic of how Garuda gets the nectar. Saturn, the ascendant lord, acts as the Vishnu planet. Vishnu is represented by blue, the colour of the sky. punarvasu represents the sky, and Saturn relates to the colour blue; the combination thus denotes a blue sky. punarvasu is also related to the mother of humanity Aditi and Vishnu was born through her as the avatar, Vamana. Vishnu is depicted as a blue being draped in golden yellow. This symbolises the blue sky with a yellow Sun as clothing. So it is clear that Saturn is representing Vishnu and Venus is representing Garuda (birdbrain). Saturn (Vishnu) rides on the Venus (vehicle and nectar). Vishnu holds the wheel of time (sudarshan chakra) with his right index finger. The right hand index finger is represented by Jupiter in PT's chart, and is related to PT’s right hand through conjunction with the 3rd lord. The wheel of time is personified by Jupiter’s placement in Revathi (the ‘time’ nakshatra). 8. Shiv component of the chart can be seen through the sign Aquarius (aqua vitae or waters of life), rising on the ascendant. The waters of life are depicted as Ganga falling from Shiv’s hair. This can be seen as ultraviolet etheric Rain of perennial consciousness. Venus is related to the Rudras or time lords, through its placement in Ardra. The Rudras are embodiments of Shiv energy. The fixed signs Taurus, Leo, Scorpio and Aquarius all represent Shiv. PT's entire chart is based on Mercury and Venus exchange. Mercury in the fixed sign Taurus represents the Vishnu and Shiv principle and Venus in the mutable sign gemini also represents the Vishnu and Shiv principle. In PT’s chart there are exactly 5 planets in fixed signs (Shiv signs) and five planets in mutable signs (Vishnu Signs). This combination results in perfect merging to produce Hari-Hara (half Vishnu, half Shiv). 9. Mars , the planet of blood, is in Uttarabhadrapada an oceanic nakshatra. Oceans and blood have one important thing is common ~ both are salty. So the planet of blood is in a nakshatra representing oceans (Earth blood). The largets amongst earth’s oceans is Pacific, which translates into Prashant in Sanskrit. So the name Prashant is perfect for this incarnation. Also the 2nd house presides over the name of a person. 10. Our Sun revolves around Alcyone the central star of Pleiades. 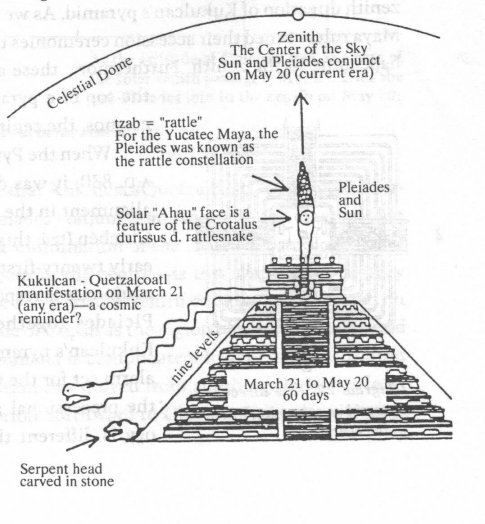 The Incas and the Aztecs through their pyramids at Chichenitza established the date for a precise conjunction between our Sun and Alcyone as 21st May. Therefore the Sun in Krittika on 21st May would be the accurate representation of Sun (solar system) connecting with its galactic counterpart. 11. Garuda (the bird brain) requires a Turtle & Elephant to satiate his hunger. The turtle is an uttarabhadrapada animal, whilst the elephant is a revati animal. The 2nd house relates to eating and is occupied by the planets Mars & Jupiter placed in uttarabhadrapada and revathi respectively.